It is a rather funny thing that that such words as “Calvinists,” “Calvinism,” and the like exist. I don’t think Calvin himself would find it either funny or flattering. He would be most troubled that his attempts to mine the truths of the Bible would be something that resulted in attaching his name to a movement, which is really a number of movements. But the terms related to Calvin’s name are useful as identifiers when used correctly. What is too easily overlooked is how Calvin the man was so different from those of us who have appropriated the name Calvinists. Calvin was often more a devotional writer than a scholarly theologian. He seems to have had one and only one audience: God’s sheep, the congregation. His preaching schedule was murderous, and his method was expository teaching through the Bible book by book. Some years ago, Banner of Truth (which is a favorite publisher) reprinted several facsimile editions of Calvin’s sermons. These were English translations from the 1500’s and maybe the 1600’s. These were beautiful books–big, well bound, and printed with quality in mind. But for reading purposes, they were less appealing. The size of the books, the older versions of English print, and the other features expected in a facsimile edition render these books hard to read. When I preached through 1 Timothy a few years ago, I don’t think I even looked at the facsimile that I have. Now here is the good news: Calvin still speaks to us today. His message is still relevant. And, translations are pouring off the printing presses that are much more manageable, readable, and attainable. 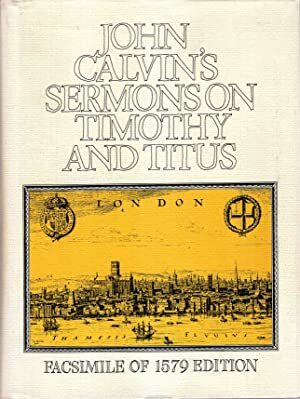 While Banner of Truth is not the only publisher to be mining the riches of Calvin’s sermons and books, they books they have made available are outstanding. Currently, I am reading from Letters of John Calvin. Banner has a more complete multi-volume edition of Calvin’s letters and other writings that is quite attractive. It is called Tracts and Letters of John Calvin. Many years ago, I picked up a four volume set of Calvin’s letters that has been valued, but under-used in my library. It was published by some scholarly publisher, and I suspect Calvin’s correspondence was rare until the recent Banner set. But most people are not going to casually or devotionally read multiple volumes of Calvin’s mail. This book is just the right size. It is a relatively small book of some 70 letters and less than 300 pages. The letters are preceded by a biographical sketch of Calvin’s life. Despite having read books and articles by the scores on the life of Calvin, I always enjoy revisiting his story once again. His correspondence provides an autobiographical look into the man’s personality and character. It is also a testimony to the front line issues of the Reformation and key figures in it. Because Calvin’s intent and life was God-centered, this book is devotional reading and theological study as well. Robert White is, as far as I know, the best Calvin translator around today. Several years ago, I received and read from his translation of Calvin’s Institutes. It is a beautiful rendering of Calvin’s words. Most recently, I have acquired Sermons on First Timothy. It rests on the stack of books I read from in the mornings, and for now, it is part of my Sunday morning reading. In other words, I am inching my way through this book of sermons. I would think that the better method would be to read a sermon every day, but time constraints prevent that right now. But Calvin can be enjoyed in just short and even infrequent doses. Cotton Mather said that he loved to sweeten his breath with the taste of Calvin before going to bed. Me, on the other hand–I prefer a dose of Calvin along with strong morning coffee. Whether read in conjunction with Calvin’s commentary on 1 Timothy or read as a resource, this book would be most useful to the pastor or teacher working through the letter. Also, as a book just for spiritual edification (as though that were a minor component of life), this volume is first rate. Take note that Banner now has volumes of sermons on 2 Timothy, Titus, Genesis, Job, Jeremiah and Lamentations, Daniel, and perhaps others that I have overlooked. Needless to say, there are far too many good books around than I can wrap my mind, time, or pocketbook around. Nevertheless, we do what we can. Inch along the way and get Calvin’s books in the new, faithful translations. Banner Books on Calvin: HERE. This year I have been teaching a history course on the twentieth century. With a number of historical periods that I have studied, read about, and taught on, the twentieth century is possibly my most frequently studied period. My class and I spent an inordinately long time studying the Great War (World War I) which, like all historical turning points, extends both back in time and forward in its causes and effects. We are currently wrapping up a study of the Russian Revolutions. Next I will be devoting attention to the period between the World Wars, leading up to a month or more of looking at World War II. The chessboard of twentieth century history includes many key players. The United States, Great Britain, Russia, Germany, and France are vital to the whole period. But one cannot overlook Italy, Japan, China, and then some major minor players like Belgium and Serbia in World War I and Poland and Spain (particularly the Spanish Civil War) in World War II. The post-war period brings in a whole new cast including Greece, Israel, Korea, Yugoslavia, Vietnam, and other countries. One could make analogies to various chess pieces and the leading countries. Then there are the pawns whose movements may or may not be significant to the causes of events. Any chess player (and I am not one) can affirm that pawns can make or break a game of chess. They can be minor pieces, but their impact can direct the course of events. This brings me to the topic of the Netherlands and the Dutch people in the twentieth century. I am not when or if the fine textbook I am using refers to events in the Netherlands after the age of Napoleon. The Netherlands was neutral during World War I (wise move on their part) and were a quick knock-out in World War II. The Dutch underground in the Second War gets some attention. The failed Allied offensive (recounted in the book and move A Bridge Too Far) took place in the Netherlands, but that story is one of the British, American, and German armies. After World War II, the Netherlands was a NATO member, but has remained on the periphery of historical movements. One recurring story is of decadence and immortality in that country which seems to be ahead of the rest of the West in moral degeneracy. The history books and the news accounts often miss or don’t know the whole story or even the greater story. The late 19th and 20th century history of the Netherlands is rich in certain respects. Unlike my hopeful title, the Dutch have not saved civilization, but they have pointed to and promoted what would be civilization saving in many respects. There are a number of Dutch Christians who lived in the middle to late 1800’s and up through the mid-1900’s who have grasped issues even more important than the immediate challenges of ending World War I, defeating Naziism in World War II, or holding on to the Free World against the Communist Bloc in the Cold War. The names are familiar to those who have waded into the deep currents of Reformed theology and philosophical thought. Guillaume Groen van Prinsterer, Abraham Kuyper, Herman Bavinck, Herman Dooyeweerd, Geerhardus Vos, Klaas Schilder, Hendrik van Riessen, H. R. Rookmaaker, and Cornelius Van Til are among the key leaders in the intellectual revolution of the past 100 plus years. I could devote quite a few paragraphs and pages to talking about the various men named above. I actually have talked and written about most of them. In fact, I have literally talked from coast to coast about them. (I spoke at two conferences years ago–one in Virginia and one in Alaska.) For now, I will focus on two of the many books that are now available highlighting key ideas from the Dutch Calvinist Worldview Thinkers, as I like to call them. Lectures on Calvinism by Abraham Kuyper is a Christian classic. It has been reprinted and edited many times since it first emerged from the Stone Lectures that Abraham Kuyper gave at Princeton Theological Seminary in 1898. One such reprinting and repackaging changed the name to something other than either Lectures on Calvinism or The Stone Lectures. The goal of all such publications is to get the message of these lectures out. This book calls for a big dose of humility from all Christians. Reformed Christians need to realize how limited our vision is when we think of Calvinism as a system of 5 Points or we think that our efforts to promote Christianity are full-orbed. Non-Calvinists need to realize how, despite whatever struggles they may be having in regard to soteriological (salvation related) issues, the claims of God are over all areas of life. Many books, movements, schools, colleges, ideas, study centers, and terms have grown out of this book. Many Christians speak today of having a Christian worldview without knowing that this idea springs from Kuyper. Kuyper, however, spoke of a World and Life System rather than using the more compact term Worldview. Every concern that comes up about the Christian role or lack thereof in politics needs to be referenced back to Kuyper’s chapter on politics. He also spoke about science, art, and the future, which can be studied for how Kuyper may or may not have foreseen events. American Vision has reprinted and edited the edition of the book pictured above. Some of Kuyper’s sentences were a bit long and heavy and many of his references are obscure to most of us. This book has modified some of the language and punctuation without rewriting or condensing the content. Also, footnotes explain many of the terms or references that Kuyper and his audience would have been familiar with. I would include this book for essential reading not just in my top 100 or 50 or 25 reads, but in my top 10 reads. Furthermore, it is not a read-once-and-shelve book. This is a book to reread often. Get it and read it. One of Abraham Kuyper’s mentors and contemporaries was Guillaume Groen van Prinsterer. Usually and conveniently, he is referred to as Groen, pronounced to rhyme with prune and equivalent to our word green. Groen was a brilliant Christian historian and political leader in the Netherlands. At some point in his career, he gave a series of lectures at his house on the key determining issue of his age. That issue was the French Revolution. It was not the details of the storming of the Bastille or execution of Louis XVI and Marie Antoinette that concerned Groen. Behind the Revolution and preceding from it was a worldview or philosophy. As has been often, but not often enough, pointed out, the so-called American Revolution and the French Revolution were not twin events. Their differences are comparable to the knife use of a surgeon and that of a street criminal. Lest someone think this is a odd-Christian weirdo interpretation, just look at such books as James Billington’s Fire in the Minds of Men. Before Billington and before all the forces for secularism, humanism, and whatever other objectionable isms of the twentieth century, Groen was discussing the essential beliefs and unbeliefs that propelled Europe into the modern age with revolutions continuing for over a century. For years this book has been hard to find. It was translated into English and published by a small Canadian publisher back in the 1980s and 90s. I doubt that it is on the reading lists of any or certainly not many college courses on the French Revolution, modern thought, revolution in general, or political philosophy. Groen would not have been shocked or surprised by that omission. Unbelief and Revolution has been reprinted by Lexham Press. Along with a number of great books, including Geerhardus Vos’s Reformed Dogmatics and many volumes by Abraham Kuyper, Lexham Press is turning into a modern center of Reformed Christian thought and theology. Harry Van Dyke, a great scholar and acquaintance of mine, translated this book. Jake Mailhot, who is what I want to be like when I grow up, is a key figure in the distribution of Lexham Press publications. Read the Dutch Christian authors. Start with Kuyper and Groen. As an incurable reader, I often find myself stumped over what kind of book I need to read next. My tastes range from theology to literature to history to politics to poetry to philosophy to biography and more. I could almost paraphrase Will Rogers and say, “I never met a book I didn’t like.” I have met a few that were not to my liking, but I am prone to find something of use in even the worst of readings. My morning reading time is when I focus on Biblical and theological books. If a book is devotional, without being fluffy, and enlightening, it makes for a good start for the morning stack of books. I have about an hour to read and usually read a chapter or about 10 pages from each of 3 or 4 books. (This method works well for me.) After the book aimed at the heart, I am more ready for the book aimed at the mind. So, a book applying Bible teachings might be read from first and then followed by a bit more weighty theological reading. The preferred third book is usually more focused on Christian worldview thinking. It might be on history, education, current issues, philosophy, or some other area. It might or might not be a specifically Christian book. 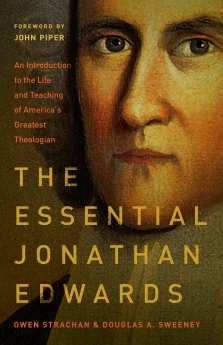 This brings us to the topic of The Essential Jonathan Edwards: An Introduction to the Life and Teaching of America’s Greatest Theologian by Owen Strachan and Douglas A. Sweeney. This book is published by Moody Publishers. In light of the different types of books I like to read in the morning session, The Essential Jonathan Edwards can fit into any of the categories. The breadth of the approach of the book itself is similar to the breadth of the subject. Jonathan Edwards is acclaimed as one of the great preachers of all time. He is also one of the great theologians. He was also a prolific writer. He is recognized for his contributions to the field of philosophy. He is studied for his views on any number of topics, both those pertinent to his times and to ours. As the subject of biography, Edwards’ life is also rich. He lived in colonial America during a period that was just past the heyday of Puritan thought and just before the period leading up to the American Revolution and War for Independence. I will assume for the moment that the term “American Revolution” refers to the change in thinking and outlook that developed prior to any shots being fired at Lexington and Concord, and I am borrowing this definition from John Adams. Back to Edwards: He was a major figure in the Great Awakening. Along his labors were limited geographically to a small part of New England, his role through his preaching and writing explained, furthered, and cautioned against aspects of the revival. He was the spokesman for this side of the Atlantic. His marriage and family are models for both understanding American culture and for spiritual edification. His tumultuous relationship with his Northhampton congregation is insightful into the workings of colonial communities and all too familiar territory for many pastors and their churches. Edwards was briefly connected to the still new Princeton University and had been educated at Yale. His life shows the richness of potential opportunities in the colonial period even accounting for the particular genius and gifts of the man. The most scholarly and library-bound academic wanting to grapple with theological conundrums (like free will and Original Sin) can study Edwards alongside the more profound student of philosophy, especially the one interested in American contributions. But the pastor can also find Edwards a helpful mentor giving encouragement to his soul as he prepares sermons and lessons for his congregation. Again, the study of Edwards is a hall filled with treasures. So where do you begin? Or how can you access the wealth of Edwards’ life, faith, and thought? The Essential Jonathan Edwards is an excellent place to begin. The book contains an account of Edwards’ life, but it is only partially a biography. 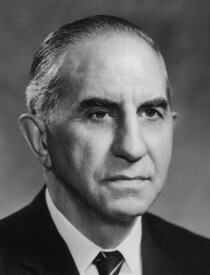 Much of the focus is on the teachings of Edwards. The book is heavy laden with quotes and lengthy ones at that. It doesn’t take many lines of reading Edwards to realize that this guy cannot be skim read. He is not impossible or overly technical, but his language is rich and detailed. While the entire book reveals biographical details, the first section is more largely focused on his life. The fourth section deals with a troublesome issue in Edwards’ ministry and in our times. Statistics show certain numbers of people who are Christian by profession. Church rolls show smaller groups of the same. Yet nominalism, that is, being Christian in name only, is a huge problem. Protestants like to think it is merely a Roman Catholic problem. Within Protestant groups, one group will wag their heads at another for this plague, but the truth is that it hits ever section of Christianity and every church. If you don’t know of where to locate the dangers of nominal Christianity, begin by looking in a mirror. I am not saying that you and I are believers in name only. But I do know it is a real threat to me. Those of us in Christian works (and I teach in a Christian school) can easily confuse occupation with salvation. The problem beset Edwards both in the times of his grandfather’s Half-Way Covenant approach and in his own dealings with a congregation that fired him. The final section deals with heaven and hell. Edwards is once again a needed instructor to our times. Because Christianity offers so much in this world, we can easily undervalue what it teaches about the world to come. And the doctrine of Hell is just uncomfortable. I recently posted a blog review highlighting a number of books on, by, or about Edwards. For the reader wanting to meet the great theologian, this is the book to start with. For the reader who has already read a lot by and about Edwards, this book is also a great read. His brand of theology was that formulated by Protestants, particularly those who followed in Calvin’s stead, and more particularly, the theology inscribed in the Westminster Standards. His philosophy was rooted in the same sources. 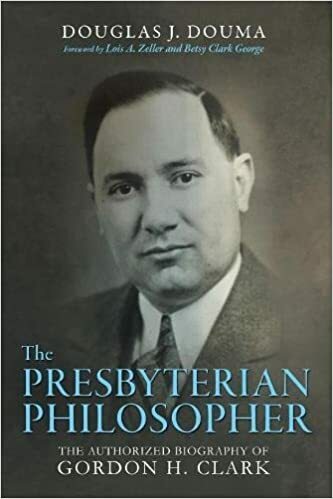 For such reasons, he has been called “The Presbyterian Philosopher.” That, of course, is the title of Douglas Douma’s definitive biography of Clark. In terms of his life, Clark spent his days at his desk writing, in classrooms lecturing, and in Christian circles discussing, defending, and debating theological and philosophical issues. A family man, he enjoyed time with his wife and two daughters, playing chess, and painting (which he worked on but never became proficient at doing). Most Christians today are unfamiliar with Clark. Most Christian bookstores do not carry his books. Many pastors are unfamiliar with his work. Yet, when R. C. Sproul was asked what theologian of our time would be read in 500 years, he answered, “Gordon Clark.” The fact that his books are not the most popular, most read, and most often quoted says more about problems of our times than it does about the man himself. 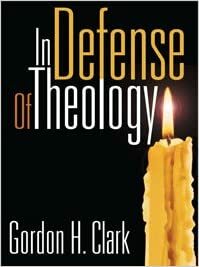 In our theology class at Veritas Academy, we recently read Clark’s short book In Defense of Theology together. I know that this was a challenge to the students because, even after having read it few years prior to this year, it was a challenge to me. Clark was a precise and clear thinker, but not one who could write on a popular level. His writings take some work, but with some persistence and a few helps, reading Gordon Clark can be quite rewarding. Clark’s main contention in the book is that theology is something all Christians should both respect and learn from. While he devotes portions of the book to answering atheists and Neo-Orthodox people, he returns frequently to his primary audience. He wants regular Christians to read the Bible with some theological skills. While he was an intellectual and an academic, his goal was edification of the believer and not simply the accumulation of knowledge. Clark affirms, “Scripture tells us about God; therefore, we should study it.” This will entail learning verses relating to a particular topic. While memorization is good, it is also necessary to mentally bring the verses together to make a whole or more complete thought on the topic. Here again, the message is that theology is essential. Much of the Bible is given in historical narratives. Other parts consists of laws or poetry, which is sometimes called wisdom literature. Theology takes place when the reader “connects simple historical events with their theological significance.” One might think of the progression of rulers and prophets in such books as First and Second Kings. On the one hand, such stories are full of interesting figures and ups and downs of Judah and Israel, both politically and morally. Theologically, however, the events pertain to God’s covenant with Israel, the promise of a Messiah to come, the keeping of God’s law, and the providence of God. So, a person can read the Bible while professing to steer clear of theology, but to understand the Bible, to see it as a whole, theology is necessary. While Clark is concerned about the average man in the pew who may not think theology is necessary, he also sees the need to address those opposed to theology on other grounds. In our day, there have been several public figures who have attained status as our public atheists. This is a far cry from the day when the late Madelyn Murray O’Hara was the key spokes-person (loud mouth) for the cause. Clark died before the current figures were prominent, but the arguments against atheism are pretty much the same old recipes. Of more concern to Clark were the Neo-Orthodox and, in particular, Karl Barth. The German Barth had a major impact on lots of evangelicals in the United States. The Barthian tidal wave was slow in coming due to the necessity of translating his work from German to English. (On might think further translation was still needed from English to comprehensible English.) Along with Cornelius Van Til, Clark was incensed by the pattern of Neo-Orthodox theologians undermining the language and meaning of theology and undercutting the authority of the Bible. (For more on this, see Douglas Douma’s essay found HERE. A key chapter in A Defense of Theology concerns logic. Clark not only wrote a book on logic, but he was driven by the topic. In short, he believed that God is logical, God’s Word upholds logic, and that logic can be used to unlock or defend Scriptural doctrines. In a discussion of logic, Clark shows how logic undergirds key passages from the Bible. He is convincing in making the case that Christians should be able to use skills honed in logic to work through the Scriptures. Gordon Clark was not a popularizer or an easy author to read. He lived and battled in a time when Reformed theology was relegated to the sidelines or consigned to the dustbin of history. I doubt that his books ever sold in large numbers, but he plugged away, writing, teaching, and adhering dogmatically to the truths that sparked the Reformation and that are founded on the Bible. Trends come and go. They did before, during, and after the time of Gordon Clark. He didn’t budge. He was steadfast and unyielding. Perhaps he could have soften a few edges, and in our time, that might be advisable in our times. But God raised him up in a different era. Nevertheless, the books remain ready and waiting for us to read and use in our times, in our circumstances. and the pocketbook may not change in the slightest. The grass is too high, getting tough, growing slowly, and a bit brown from the heat and lack of rain. School has started. Nights a bit longer now, and there is a promise of cooler weather not so long from now. Personally, I wish time were moved six to eight weeks back and I were stuck, isolated, abandoned with only my family and lots of books at some beach house overlooking the incoming waves or some cabin in the mountains with a valley to see from the back porch. But that didn’t happen in June or July or August, so I accept the inevitable–September. But as De la Casa noted in the quote above, there can be riches found in the month of September. Of the making of study Bible in our times, there is no end. That is not given as a complaint, but as a thanksgiving. I have often read the concern about study Bibles which says that people will be prone to read the notes in the Bible and accept them as being on a par with Scripture. My problem is not anywhere near that. I am prone not to read the notes at all. In fact, my preferred daily reading Bible has no notes or added materials, except maybe a paragraph introduction before each book. The Worldview Study Bible is published by B & H Publishing, an outstanding source for Christian books and Bibles. For high school or college students, this would be a great resource. The translation is the CSB, which is produced by B & H (or Holman as the Bible arm of that company is called). Others more qualified can weigh the merits or problems with the CSB translation. I can lament that we have the NKJV, ESV, NIV, and now the CSB, along with many others, that are making a common Bible among Christian folk nearly impossible. I can give a somewhat approving nod to those who prefer the King James Version (while separating myself from those who contend that the devil is the source of all other translations). Hey, we live in a time of many sound, conservative, evangelical Bible translations. That is not exactly the stuff of Foxe’s Book of Martyrs caliber problems. The key feature of this book is the inclusion of large number of essays dealing with Christian worldview issues. I know there is some debate back and forth over the concept or limitations of teaching about having a Christian worldview. I know that sometimes we have used the term as a way of importing a somewhat Americanized and politically conservative way of thinking into our Bible studies. I know that the term Christian worldview can be trivialized and separated from other aspects of the full orbed Christian life. But I still like the term. I still buy, read, and borrow from books promoting a Christian worldview for interpreting every area of life and thought. I am a Kuyperian, a devoted fan of David Naugle’s book Worldview: The History of a Concept, and a promoter of Christian education that teaches worldview thinking. The topics in this study Bible range from theological issues like inspiration and inerrancy to social issues like recreation, careers, LGBT concerns, and more. Science issues relating to creation/evolution debates and gender debates are included. Essays on philosophy, politics, economics, music, and other such ideas are also here. The essays are authored by some leading Christian teachers, pastors, and writers, and they are placed throughout the Bible in places that tie in with the themes of each book. I have just begun to harvest the fruit of this fine study Bible. Those looking to understand what is meant by having a Christian worldview or those who are teaching others would enjoy this work. Every Moment Holy is published by that delightful and creative group known as The Rabbit Room. This is a beautiful book both in outward appearance and in content. Buy it for someone for Christmas, but get at least 2 copies because you will want to keep one. It consists of prayers for every moment, time, and circumstance. My morning history study is Justifying Revolution: Law, Virtue, and Violence in the American War for Independence. Edited by Glenn A. Moots (author of Politics Reformed) and Philip Hamilton. While this is a slow and studious read, it is a great look behind the battles and leaders of the American War for Independence that considers the books, ideas, philosophies, and ethical concerns relating to that war. Martin Luther’s Commentary on Saint Paul’s Epistle to the Galatians (1535) is published by another new publishing group, 1517 Publishing. Translated by Harloldo Camacho and with a foreword by Michael Horton, this big book is even bigger than it is. (Yes, I know that is awkward phrasing.) At 557 pages, this book is the Protestant Reformation, the 5 Solas, the confession of what we believe. A historical document–yes–but also a great study into a pivotal teaching of the Bible. Praise God for this new translation. Two days now into reading Eternity is Now in Session by John Ortberg, published by Tyndale Press. We are not just waiting to get to heaven so all will be experiencing eternal life. It is here and now and eternal matters are not just some heavenly idealistic realm but are for here and now. Powerful and instructive. After a few unexplained delays, I am now reading Atheism on Trial by Dr. Louis Markos. If he writes it, I want to read it. He is both a gifted writer and an engaging (irrepressible) speaker. This book is no fluff work on current atheist evangelists, but is a serious look at atheism and its related philosophical and scientific ideas as found in the ancients, in philosophers of past centuries, and in the current discussions. Published by Harvest House Publishers. I am always glad to see another edition or promotion or quote from Abraham Kuyper’s lectures at Princeton in 1898 that have sometimes been called the Stone Lectures or more commonly Lectures on Calvinism. Going back to the topic of Christian worldview thinking–this book is the foundation of all the modern applications. Brilliant. Thanks to American Vision for publishing this new edition of a Christian classic. An added feature or benefit is that this edition contains some slight alterations in punctuation so as to make the text flow. Kuyper is not an easy read, and so having a few modernizations to style issues is a help. In my opinion, Lectures on Calvinism is one of the most important books ever. I might have titled the book under review a bit differently. I would suggest it be called Eleven Christian Leaders of the Eighteenth Century along with One from the Nineteenth Century. That title is too long, but it reflects the fact that the reader gets lots of insights into the Christian mind and character of the author, Bishop J. C. Ryle. Let me begin my review with a different approach. These are Augustus Toplady’s four main points about preaching. Most of us know Toplady primarily for his hymn “Rock of Ages. The following is from page 352 of the book. Preach Christ crucified, and dwell chiefly on the blessings resulting from his righteousness, atonement, and intercession. Avoid all needless controversies in the pulpit; except it be when your subject necessarily requires it, or when the truths of God are likely to suffer by your silence. When you ascend the pulpit, leave your learning behind you; endeavour to preach more to the hearts of the people than to their heads. Do not affect much oratory. Seek rather to profit than to be admired. These four points were not only at the heart of Toplady’s preaching, but were central to all the leaders who were the subjects of this biographical study. The past was no more totally Christian than the present is totally non-Christian. The Eighteenth Century, the 1700’s, began as a time of Christian and evangelical drought and deprivation. Scarcely a century after the waves of Puritan revivals, the faith had largely stagnated into Deism, formalities, and works righteousness for the churched folks. For the unchurched, many of whom were poor, ignorant laborers, gin and immorality were dominant. God sent revival to the British Islands. The book begins with two chapters describing the cultural and religious conditions before and when the revival movement came. The first two leaders in this book are also the best known: George Whitefield and John Wesley. Each man’s story is a fascinating portrait of how God works to save sinners and raise up preachers. How odd that Whitefield was first lead by the Wesleys while at college, but then became the first of those three (John and Charles Wesley and himself) to be awakened to real, saving knowledge of Jesus Christ and of the new birth. Whitefield was the first to do something utterly shocking: Preach outside the walls of a church building. He ruffled lots of clerical feathers in the process. Of course, he and his dear friends, the Wesleys, parted and sparred over Calvinism. I first became aware of this while in my freshman and sophomore years of college. Actually, what I became aware of was that there was a man named Whitefield (too often ignored in Methodist circles where I grew up) and Calvinism. I read Wesley’s sermon on Free Will and then Whitefield’s answer. Whitefield drove Wesley off the field in that battle. Wesley’s greater skills at organization and administration enabled the Wesleyan branch of Methodism to trump the Whitefield branch. To a large degree, Whitefield was buried in church history until Arnold Dallimore penned the first volume of The Life and Times of George Whitefield. 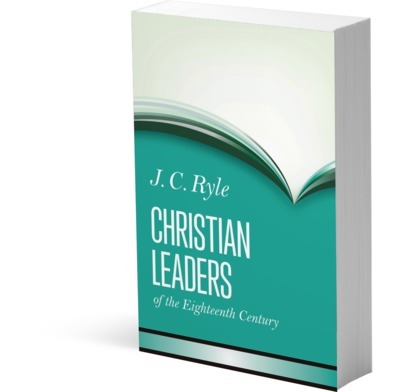 During those same decades, books like Ryle’s Christian Leaders were not handily available either. Lest my proclivities make this a Whitefield versus Wesley/Calvinist versus Arminian post, Ryle always stated his commitment to a Calvinistic interpretation of Scripture while commending men who differed. His chapters on Wesley and John Fletcher, another Arminian, were included to highlight great preaching and the godly lives of these men. In regard to Augustus Toplady, who could often be the John Robbins of his day, Ryle notes that he was sometimes a bit too caustic in his attacks on Arminianism. Whitefield, Wesley, and Toplady were the only three of the eleven that I was familiar with. The other men covered are William Grimshaw, William Romaine, Daniel Rowland (I think I had heard of these three a few times), John Berridge, Henry Venn, Samuel Walker, James Hervey (not the scientist), and John Fletcher. They were all great preachers and/or solid writers in their day. They were all Church of England men, as was Ryle. Most were highly educated. Perhaps the most fascinating common trait was that most entered the ministry without a clear grasp of essential, evangelical, and Biblical doctrines. In their early sermons and ministries, we can say that, at best, they were muddled in their thinking. Did they even know God at those times? Were they saved, to use more contemporary language? Were their doctrines sound and orthodox? These questions involve some heart issues we cannot determine. But in their early days, their beliefs were incomplete and defective. It is utterly astounding how God reached each of these men (and no doubt, many others) in divers times and places and awakened their minds to the beauty and power of the saving grace of God. For certain, these were not men to hide their lights under bushels. Quite the contrary, in each of the eleven stories these men pastored congregations, parishes, or whole lands (as in the case of Whitefield and Wesley) where they preached and preached and preached. In several cases, if they did not literally die in the pulpit, they preached themselves and worked themselves into early graves. Zeal for God’s House, Name, and Saving Grace consumed them. Sometimes, I found myself wishing that Ryle’s subjects could say or write something that didn’t sound overly stilted or spiritual. It seems as though none of these men said things like, “It has been a rough day and I have a headache.” Instead, they said things like, “I am been buffeted hither and yon by the storms of life, yea even by Satan himself, and I feel pain in my head reminding me of my own unworthiness and weakness in the flesh.” I like the heart of that last statement and subscribe to the need to think more Christianly, but sometimes feel that these men are too marble-like and ideal to have been flesh and blood folks like me, my pastor, my friends and brethren. Not, of course, that there is any magic about the past. People were no cleverer then than they are now; they made as many mistakes as we. But not the same mistakes. They will not flatter us in the errors we are already committing; and their own errors, being now open and palpable, will not endanger us. Two heads are better than one, not because either is infallible, but because they are unlikely to go wrong in the same direction. Reading this book–Christian Leaders in the Eighteenth Century–did not leave me thinking, “This is how it (Christianity) should be done.” It did leave me with lots of convictions, reminders, a few laughs, and a desire to see ongoing revival and reformation in our day. When and as God sends revival into 21st century North America, Brazil, England, Africa, etc., it will not look like the world Ryle described. But there is so very much found in this book that will be found whenever and wherever God pours out waves of revival and raises up Christian leaders. I still have not recovered from something my college student daughter TaraJane told me a few months back. She said that theology majors in college that she knew were the most cynical students around. By that, she went on to explain that they were critical, negative, and generally contrary in their views on church, the Bible, God, and life in general. I think that theology students should be giddy most of the time. That is not because the study of theology is light and breezy, but because it exposes the heart and mind to an incredible array of richness concerning God, the Bible, the Kingdom of God, salvation, truth, mankind, and all of life. I am, at best, only one who dabbles in theology. My training, college education, and main work experiences have not been in theology per se. I am a history teacher, a literature teacher, an administrator in a Christian school, and a book reviewer. But I have also been a pastor/teacher/elder for several decades. I have no formal theological training, but have played on the scrub teams for years by reading lots of books, listening to sermons and lectures, and acquiring a working familiarity with theology. One of the too often used descriptions of theology is that the study is dry and dusty. Granted that is possible. All fields involve some archived information that is a labor to wade through. Some writers are technical and analytical in ways that prevent them from being readily readable. Often theologians, like scholars in all fields, write for an audience of peers and develop a language that the insiders are familiar with but that stumps the novice or newcomer to the studies. When you are reading and thinking, “I don’t know what this book is talking about,” you may simply not know enough of the background. Be slow to condemn, but don’t be ashamed to be baffled. But is theology just an academic, scholarly, intellectual pursuit? Of course, it can be. The same can be said for the Battle of Gettysburg. At its best and in terms of its primary purpose, theology is designed not to equip brainy, intellectuals who are Christian with an outlet for their mental synapses. Rather, theology is to minister to, teach and instruct, comfort and confirm the Christian sitting in the pew on Sunday and working at the factory, elementary classroom, hospital, or home on the weekdays. I want to call attention to two books I read over the past several months that are made up of incredibly rich theological discourses. The chapters in these books were given as sermons and talks. I find myself feeling dizzy at the thought of giving a talk on the high level of the contents of these books. Yes, there are some things hard to understand. No, these are not the works for a new and unread Christian to pick up. But everytime I think back on either of these works, I remember just how they were packed full of soul-nurturing, mind-pleasing, convincing and convicting truths. These two books are pictured below. 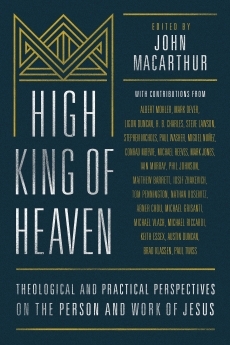 The first one is High KIng of Heaven: Theological and Practical Perspectives on the Person and Work of Jesus. It is edited by John MacArthur. Contributors include Albert Mohler, Mark Dever, Ligon Duncan, Michael Reeves, Mark Jones, Stephen Lawson, and many others. These men are some of the foremost preachers and teachers in the various branches of Reformed and Evangelical Christianity. Published by Moody Publishers and The Master’s Seminary, the book is hardbound and affordably priced. The second book is Oh Death, Where Is Thy Sting? Collected Sermons by John Murray. It is published by Westminster Seminary Press. Let me begin the examination of these two books by discussing John Murray himself. Murray was a Scotsman and was primarily a teacher of systematic theology. He fits my favorite image of a true Scots Calvinist: He was stern, serious, somber, and searching. Add scholarly to that list. 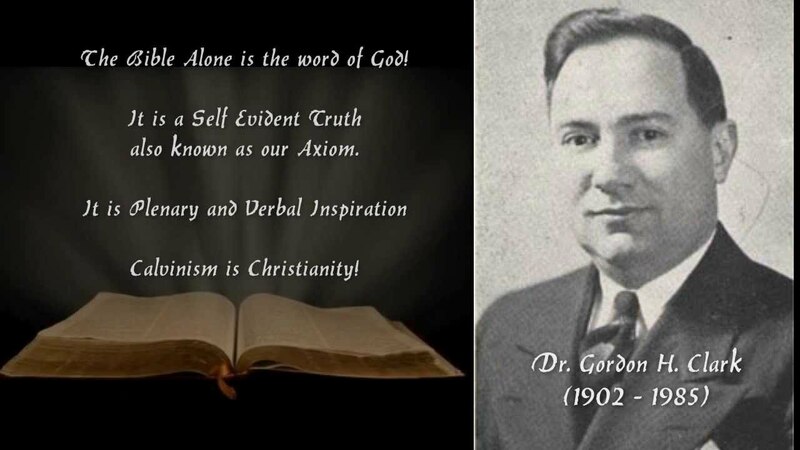 His major works are Redemption: Accomplished and Applied and Principles of Conduct: Aspects of Biblical Ethics. He also wrote a powerful commentary on Romans, and his various writings were collected together by Banner of Truth into a four volume set of the Collected Writings of John Murraywhich is temporarily (we hope) out of stock. On different occasions, Murray did do some pulpit supply. In the case of these sermons, which were preached to small congregations in Canada and the Scottish Highlands, Murray was filling pulpits during his summer breaks from seminary. Most of these sermons were transcribed from audio messages. As is noted in the editor’s comments, a sermon read does not contain the emphases and style and passion of the spoken message. Nevertheless, the the theological ground covered in this collection is vast. The first seven sermons are from Romans. They might serve as a helpful overview of Murray’s commentary, and one would wish we had a collection of sermons covering all of Romans. Since Romans deals so intricately with salvation including justification, sanctification, election, and so on, Murray beautifully explains these doctrines. The next eight sermons are from various texts, mostly from the New Testament. The final selection is Murray’s charge to Edmund Clowney, who was taking on a theological chair at Westminster. This book has been very beautifully crafted. See the pictures connected to the link above. It can be read in part or in whole, beginning with any one of the sermons. It is a book I thoroughly enjoyed and hope to read from again and again. In this section, Michael Reeves begins with “The Eternal Word: God the Son in Eternity Past.” Paul Twiss follows with “Son of God and Son of Man.” Mark Jones, author of Knowing Christ, speaks on Isaiah 50 and the topic of “The Son’s Relation with the Father.” Subsequent chapters are the Virgin Birth, Christ as the Bread of Life, the Good Shepherd, “The Way, the Truth, and the Life,” and Christ as head of the Church. Messages in this section are on the different phases of Christ’s incarnation, life, death, resurrection, ascensioin, and second coming. This portion includes a discourse called “No Other Gospel: The True Gospel of Christ” and another on the completion of the New Testament Canon. Two subsequent portions cover the relation of Christ to the Old Testament. Twenty three messages, all focusing on different Bible passages, with little of no repetition, differences, or diversions–this book is a gem for theological study, devotion, or sermon preparation.